This pie is the beginning of the end. My grandmother used to say that you could taste when pies were made with love. This is not a pie made with love; this is a pie made with meticulous precision, a pie made with sharp knives and salty tears, and quick, deliberate movements. This is a pie that shows you you, as in a mirror, or the river. This is a pie to make to keep you from killing yourself. This is the pie that will save your life. Serves between 0-4 people, depending. 1 hr. prep (but not all of it work), 45 mins. bake time. Chicken, roasted, whole. Mine came from the rotisserie place, at the supermarket. Roux, instead of rue: you will need a little more flour, and butter. Dried ginger; dried fennel; a dried chilli. Rolling pin. Empty wine bottle. They are the same. Slice the chicken meat from the bones, and set aside the carcass for stock; note how the knife goes through the meat. Concentrate, hard, on cutting the meat into small and equal pieces. Equal pieces don’t matter for the pie, but it will keep you calm. Dice the onions, and mince the garlic. 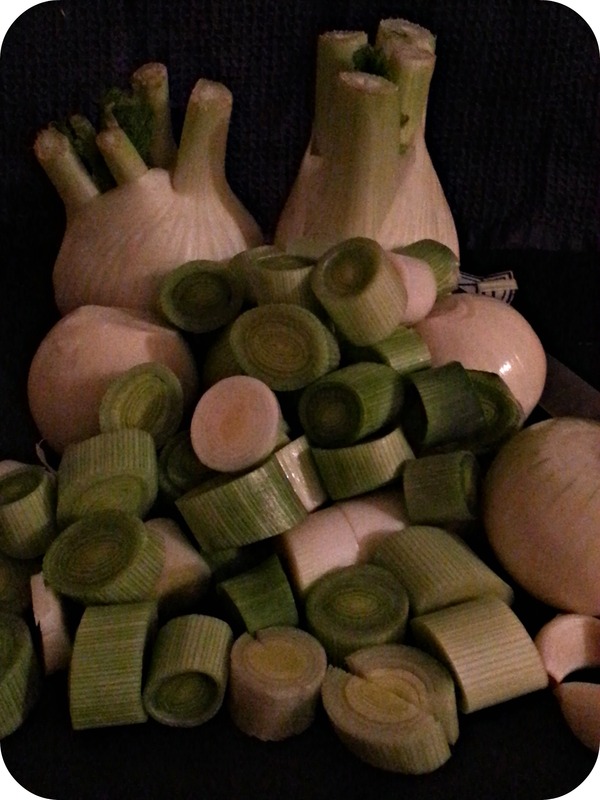 Wash and chop the leeks, into little half-moons. Slice thinly the fennel, noting the patterns in the bulb. This pie is all about noticing, and concentrating. Look how beautiful the fennel bulb is. Look how neat it is. Look how alive you are. Run your hands under iced water (the cold tap, run cold). Here you can pretend that you are far away, and that the water is the water of a river in a place where there are no demands on you, and you can be safe. You can pretend that, but you don’t have to. Chop the butter, and the lard, into little dice. The uneven-ness of their measurements is called the wrinkle; my grandmother taught me that. My grandmother taught me to make pies, and the cautionary ghosts of Aunt Soggy and Aunt Sponge watched over us. Aunt Soggy and Aunt Sponge were my grandmother’s great aunts; they were not great bakers. Rub the flour into the fats, letting it sift, and fall. Feel everything. Note everything. You are not alone. You are not alone. Aunt Soggy, Aunt Sponge and your grandmother are standing over your shoulder. Follow the recipe; you are not alone. Pastry cannot be fudged, or hurried. You are doing the same as them, then; you are not alone. It is impossible to be alone while you bake. The kitchen is crowded with ghosts. You are not the only person to feel this way. You are not alone. Bind the pastry together, rolling into a fist-sized lump. Add iced water, if it won’t bind, but only a little bit. Handle it lightly. Wrap in cling-film, and chill. Spread flour across the table. Ignore the way that flour grains on wood make you cringe, the way other people cringe at nails on a blackboard, or balloons squeaking. This is how we make pastry. You are not alone. Roll out the pastry to the base and sides of your loaf tin, the thickness of a tenpenny piece; save some for the top. There should be a little overhang, to pinch it closed, later. Oil your loaf tin, or your tins. Lift the pastry, carefully, carefully, into the tin. You may want a spatula, some extra hands, or a Tall Man. It will be difficult whatever you do; it will almost certainly tear. Keep breathing. Pinch together the broken parts. It won’t be perfect, but it will be okay. Then, roll out the last piece of pastry to fit the top of the loaf tin; if you have the flan tins, you can use them as a template, or a stencil for the lid. There will be offcuts; that’s okay, too. Shape the offcuts into little holly leaves; my grandmother told me that holly leaves show that it’s a meat pie. This might be true, it might not, but I do it, anyway. Or hearts. I do hearts, sometimes. Fry together the onions and the garlic, over a medium heat, with plenty of olive oil. Let them soften, add the leeks, and the fennel. Add pepper, and rosemary. Add a heaped spoon of grainy mustard. Add the chicken. Let them brown a little. Taste. Taste. Add a shake of the ginger, a shake of the dried fennel, a crush of the chilli. Pour over a splash of sherry; and a good glug of chicken stock. Cook it down. Don’t let it burn, but cook it down. Melt butter and flour together for the roux; add that, watch it thicken. Watch it thicken; watch it settle, steadily. Let it thicken. You know the consistency pie filling should be, don’t you? It should look like that. Turn the heat off. Spoon the chicken filling into the pie case, and fold the excess pastry round over it. Lie the lid across it. Pinch the edges closed, the way my grandmother showed me, pressing your thumb down, leaving no gaps. Pierce the top, with a fork. Press the holly leaves (or hearts) around the little air-holes. Beat the egg. Brush the whole with the beaten egg; this will, of course, be easier with a pastry brush, if you have one. I don’t, and I sort of smother the pie in egg with drippy fingers. It works. It’s okay. It will be okay, I promise. Put the pie in the oven. Wash your hands, thoroughly, running the soap over your thumbs and your thumbs into your palms, the way they do in the posters in school bathrooms, scrubbing and scrubbing, until every single trace of the flour and the egg is gone. Look at your pink hands. Remember that you are alive. Sit down. Breathe. Breathe. Breathe. Don’t cry. Don’t cry. Find a blanket. Set the chicken timer for twenty-five minutes, if the little pies, or forty-five, if the loaf-pie. Sit. Sleep. Don’t cry. Wait. Can you be bothered to get off the sofa? Yes, you can. You can get up. You can. Walk to the oven, and look at the pie. Is it golden? Is it crisp? Take the pie from the oven. Look at it a while. Look at it. Wonder if you can eat it. Wonder what to do now. See that you have made it. See that you have made it. Sit on the sofa. Look at the beautiful thing you have made. Look at the golden thing you have made. Try not to cry. Fresh from the oven, on the trivet to cool, and beautiful. this is no recipe. this is poetry. this is literature. thank you!